Biobserve Forced Swim Test Depression Response Behavioral Rodent Monitoring . New Life Scientific, Inc. This is a great working Biobserve Forced Swim Test System. It was just removed from a reputable pharmaceutical company. Up to 8 animals can be tested simultaneously. This system consists of four, two-station camera boxes with infrared background illumination and a camera box to protect and fix the video camera. Each viewing area can hold two water containers. (No containers are included with this system.) Includes Windows PC with BioObserve Forced Swim Test Analysis Software installed, Quad camera imaging unit (PC has a video capture card installed). All power cables and imaging cables (5x-25' cables). Software was installed by us, then the AWESOME tech support staff at Biobserve, remotely connected in finalized the installation. 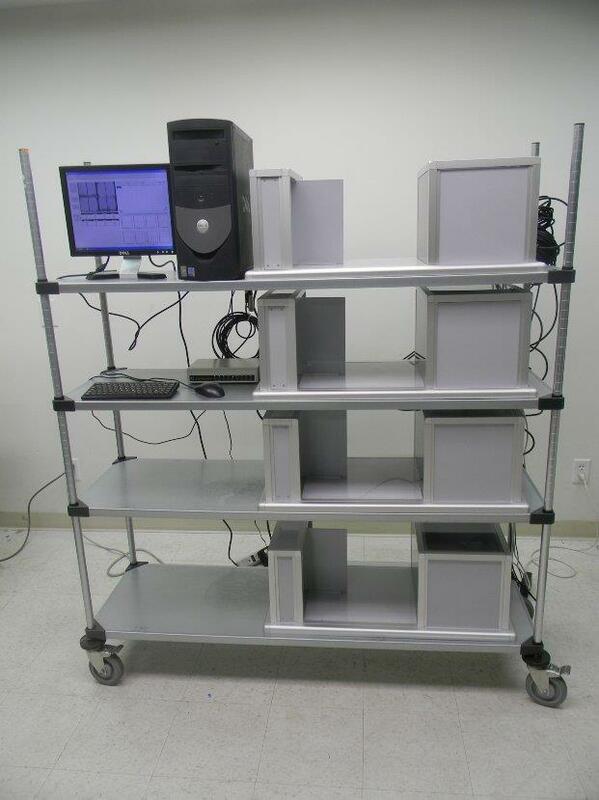 Software will monitor up to 8 animal tests simultaneously. It recognizes if the subject is floating, swimming, or struggling, reports both in graphic and numeric format percentage for each camera. All acquired data are calculated and presented in real time already during the experiment. The possibility to save different setup configurations and to generate pdf based summary reports automatically makes it even easier to deal with your test sessions. We simulated animals only using our hands and got each station to register correctly. These systems simply work great. And honestly, Biobserve's tech support is incredible. You're sure to receive the highest quality support for this system. The keyboard, monitor and mouse are NOT included with this system. The cart holding this system is optional, but keep in mind that it would increase the shipping expense.